We know what we're going to be for Halloween! That feels like the most important thing this week and should be the opener. Start practicing your "that is too sweet" gasps, cause it's going to be adorable. Jacqueline slept in a six hour stretch. This is not the norm, but it happened. It's possible. Blake has been waking up only once to eat at night. Feeling hopeful! We went to a kiddie fall fun place. IDK what to call it. There was a hay maze that Wade decided he needed to be carried through. A bouncy pumpkin that Wade just stood at the entrance and cried. And there was a corn pit. 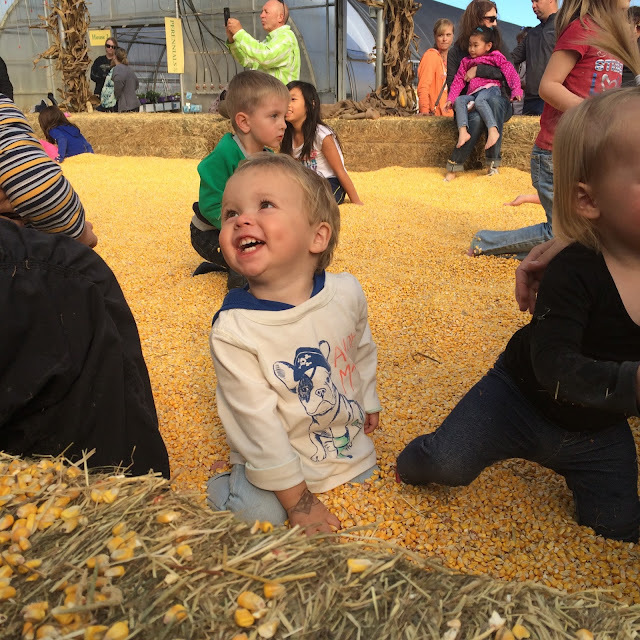 The corn pit was a hit! Look at the elated face! Oh, and Wade stole a pumpkin. Doggie has been joined us for breakfast. He's attempted to join us for bath time, but I wouldn't allow it. All animals are doggie. All yummy things are cheese. Everything is mine. He also started calling the girls B (for baby). Wade got up on the counter and took a bite of every piece of fruit in the fruit bowl. We had to eat a bunch super fast and lost a few pears that were beyond redemption. There are also bite marks in all of my decorative styrofoam pumpkins. Thanks kiddo. Having a chocolate frosting pop for the first time. Eating one of the apples he "found" on the counter. And getting his head stuck in a chair (he keeps trying to get through under the arm rest, you'd think he'd learn!!). And Note that these are all in the same outfit. The number of things we do in a day is exhausting. This kid is so busy! 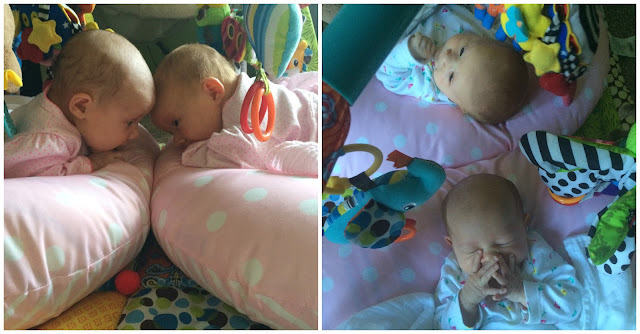 The girls have been awake a lot more and occasionally awake and not crying. I love this age when they start being interested in their environment. Jacqueline even gave me a smile this week! It might have been gas. Whatever. I also got a wonderful surprise in the mail - posted about it here. And Wade posted about the girls one month here (which we post-dated, cause I'm terrible). Both have WONDERFUL pictures of the girls. 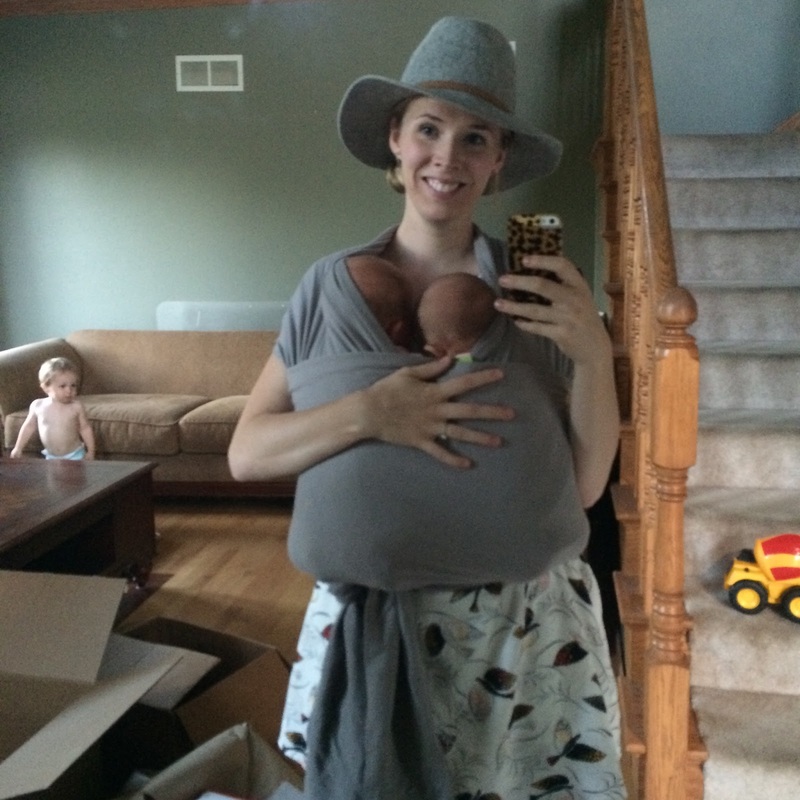 I figured out how to tandem carry these girls! It's a little impractical. And hot. And they kept rooting. But it's possible! This weekend we plan on moving our furniture over to the new house. I am so excited! I have these delusions that with all our stuff here this place will come together instantly. Oh, silly me. But I do think it'll look way better. And at least I'll know what things I NEED :). Oh bother, Wade just brought me Husband's deodorant with some teeth marks in it. Guess that's me cue to go. Seriously, why does everything need a taste test? Is is a territory marker?!? !